Home from the gig and it seems to be my Birthday!!!! The Bengals seem very excited, tho that could be from the amazing long fingered ending in toys glove Kimberly Butler sent to me. Hard to tell. I know I went to the gig, STILL tired from last nights party, thinking ah, V-day, ballads, long slow love things (forgetting completely we don't know that sort of stuff) but the night had other plans. Anyone spending V-day with Paul and Lorraine knows what they want out of the Holiday. Full on, the whole night, and it got pretty funny, with me saying things like "Here's another for you lovebirds out there, an entire song about a guy with a horrible life who gets hung!" Moving on to back to back songs about dead guys at a wake, and then a song about the guy drinking himself to death, rounding it out with dude sitting on a grave talking to dead dude he doesn't know! We also, oddly enough, snagged serious tips for Danny Boy. Someone was clamoring and I hit the tip jar and said show me the $$ and someone dropped a 20. I asked For or Against? Against it was, so I said, right, tips are non-refunable, anyone who wants to outbid you, we need $30 more to play it.....Got it, and Paul played it straight and got his first standing. Nothing screams V-day like Paul and Lorraine! All concerned had a blast. Last night was almost too much fun! Still can't take it in. THANK YOU for being there, and thank you for all the wee gifties! But I especially want to thank you for the Unicorn Song. For those who didn't know, everyone in the Irish scene requires big cash tips to play it, and I challenged the Fiends and the people at the show. $500 and we would do it. Total came in at $539.68. All going to Great Lakes Bengal Rescue! The Kitties THANK YOU! Another cool thing is that there are glow in the dark tee shirts commemorating last nights show. Lysandwr designed them and has set it up. Price is cost plus $5 to Great Lakes Bengal Rescue, with all monies going direct to the fund. Anyone needing a tax deductible receipt will get it. Lys also says there are MANY more sizes available and she will help set up what ever you need. Also, she says she has had inquires about putting different Fiendish sayings on shirts, and I say go for it. The shop is totally for the Bengals and so we get cool shirts, coffee mugs whatever. If you want it on something, we will do it. Cost plus $5. The next webcast is St Pats Day. We are, apparently, playing the Water Street in, in the pub and moving to the ballroom from 2:00pm to 1:00am. I know that looks strange, but no, that is not a typo. 11 hours of Paul and Lorraine (Fod help us all) if we can talk Dr Wicked into it, it will ALL go live. There will not be a new post on March 18th. Love and Happy Birthday to me! Fod bless your Boss, sweeties for Quiche. Wow, I think I will have to take breaks from the webcast on St Pat's day. How the heck will you and Paul play for so long? Your arms will be killing you! HA. Win! Sally, thank you for the race! And now to read the post. Aw, I'm glad it was a great day, and many good birthday wishes are being sent your way. I'll be happy to help on St. Patty's as well. This is your birthday song, it isn't very long! Hey! That is so cool from Boss! I can't wait to get me some pennies together & get me some shirts! I said it before and I'll say it again, Happy B~Day Ms. F! I'm up for 11 hours of webcast, assuming we can get a good net connection (read: actual network cable). We'll make it work. I'm thinking that we should break it up a bit and have interactive portions of the show where Fiends watching online can ask questions or be sent on quests. More ideas as they foment. And I'd like to have more than one camera going and I'd like to have a virtual guestbook where both people physically at the show and people abroad take pics of themselves watching the show (or even better, videos) and post them on the site. The wee hours are the time for scheming. That is all for now, keep me in the loop about any usability problems you have with the site, got a lot done today but I expect there are more bugs, we must sift the earwigs from the cute little ones we want to keep. Stcay, how are the kitties now? Hi Sal; Stella is having icky potty issues but other than that she appears to be fine. The stray is still in my bathroom. His injuries between him licking them & me swabbing them w/hydrogen peroxide seem to be not; well; pardon the grossness; oozing like they were. Everyone is sleeping right now & I'm off myself. Ellen got me a gift certificate to my favorite bead store for valentine's day so we're off tomorrow to find some cool things. Yay! shiny! shiny! Maybe even some swarofsky crystals! El, your massage skills WILL be required! As to how we can do it on St Pats..We can't. Not possible. But each year we do it. Somehow. I fear it. Greatly. Helps that a "gig" is four hours. And on St Pats, is billed double. $$ help, but not enough. It's freaking HARD, to be ON for that many hours???? Cool vets will help. Ours does. 11 hours on St Pats? OOF. Brave, you are. Stacy I'm glad to hear that your kitty is better, as well as the stray. Swarovskis..you have good taste! Eating heart shaped cookies in the honour of the event. Wishing you many happy return of the day. Sounds like you had still a great gig, depite it being Valentine and all. Na - The white ball on The Prisoner was called Rover. 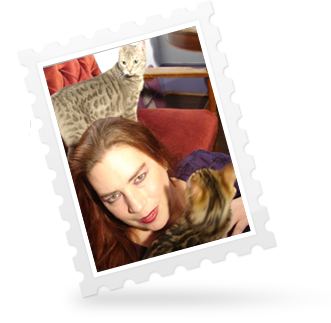 Sally - Cute kitty "banner"
Love the new site and can hardly wait for some exploratory spelunking later. Just got back from Bill Cosby. All that laughing has made me tired.... Well, that and the champagne. Q, have found my thoughts returning to the webcast on and off today. SO much fun. Thank you again for sharing the gig with us. The v-day gig definitely sounds lively! And what a very sweet birthday note to get from Boss. Nice. And Dr. Wicked is the best. And I'm sure there's other stuff but we just got home from seeing Hunter Gatherers (V-Day gift to Husband) and having dinner (they made a veggie mango roll so we thought of you, Quiche!) and I can barely stay awake. Such a good weekend and it's still not over! Glad you liked the corpses. You're so easy to shop for. Happy birthday! hope your day is fun and full of rest, cats, dog, horses, bees and treats! Sweet message from your boss, quite thoughtful. St. pat's day will be a marathon to be sure, and will be fun to look forward to. have a great day all lurking and delurking fiends! HAPPY BIRHDAY FROM FIEND EMILY! However, I feel like we are getting the present by having you here among us. Happy B day 2 U! I sem to recall that one of the fiend has her birthday on the 15th as well (only can't remember which one and Facebook is not telling). So glad the gig was packed and fun (if harder work than you expected!). What a lovely day for a Firbday! Sunshine! Wee! Today is also the birthday of my sister-in-law's uncle. He is 95 years old today. He is a farmer who still lives and works on his farm, with his dog Lily (who is an outside dog and scruffy and very lovable). Looking forward to St. Pats! I am feeling creative today. Might get more done on my Night Garden images. Wee! Quiche, hope your day is filled with rest and recovery and all the love you can hold. Artifact!!!!!!!!! That's my sister Tracy!!!!!!!!! She Came To My Blog!!!!! !THAT is the best B'day ever!!!! Welcome her, she is the coolest EVER, you would love her!!! She is a potter and makes the best things, anything you want! She would make you FIEND pottery if you wated. And she sent me dead things for my B;day. Nothing says love like dead things! A rattle from a snake, a shell of a cicada and a very long sea horse! You guys will love Tracy! Oh Thanks for the B'day wishes! I would twitter updates of the day if I twittered but I don't so you have to get it here. BIG plans, may not be able to ride, but I do have ideas about BATH and, well, ok so that's as far as it goes, but LUSH baths are not to be taken lightly.. I'm in Dublin with Louisa now, counting the hours to Coraline. Yay for fiends and fiendish new site! Birthday Baths are the way to go. Go forth and Bath! I can't believe I missed the appearance of Woodsman Hans. Curse me and my adherence to regular bedtimes! Happy Firbday to you, Q! You do know how to make a weekend of it. :D Here's wishing you Health, Prosperity, and Abundant Happiness. Have marked St Paddy's on the calendar. I mean - that was already there of course, but I added "Paul and Lorraine Webcast". Laughed at your note about not posting on the 18th. It's sunny here, too! Planning an expedition to the Outside. A lush bath sounds like the perfect birthday treat! Your sister made you that awesome teapot, didn't she? I remember a picture of a beautiful teapot pouring blue Gatorade into a cup for Kitty. Oohh, a steaming cup of tea while in the lush bath.... Heaven. Welcome sister of Quiche and any lurking and de-lurking party fiends!!! Let's party like it's 2009!! I have a day OFF today!!!!!!!!!! Merry Housekeeper is taking care of the dog as my B'day pressie, so I am not going into work! An entire day HOME with Bengals! I have no idea what to do with it. It's noon. I have nothing I have to do until tomorrow. Welcome Tracy! Is there a web site where one could peruse these pots? A day off? Nothing but Bengals? I, on the other hand, am at work. Bah. Time to try and get some Magic! And happy birthday to me as well!! Are you in San Francisco? If so, is it raining there? It's pouring in the East Bay... Yay for rain!! We need it SO badly. Aquarians unite! My b-day (and Adri's) tomorrow! And to Ticia and Adri tomorrow!!! They can make ANYTHING for you, if you can imagine it. She once got famous for her dog on Ripleys Believe it or not, as they had made him a suit of real Armour. She's just like me, only REALLY funny. Could slay myself on her wit. Oh, I''ve been havign Magic time, and Lear and Mab time, and Venus and Mim time. We all had tuna to celebrate my Birthday. Doesn't get any better than this! Ok, so I have an entire day off, and it is my Birthday, and here is me all alone on my new blog?? Doesn't anyone want to hang out with poor little me? You all had tuna? You mean: You as well? Now I am seriously impressed. Working. On computer, so occasional comments. Having a hard time focusing on this stupid project that Must Be Finished Today. Could they be having some real life activities away from the computer? Taking advantage of the fact that you are supposed to be in the bath (DON'T dip your computer in the bath). But what is our journey of discovery without failure along the road? Boring. That's what it is. Thus a new lesson about the deeper secrets of life is uncovered by failure to write over heart shaped candy. Very Zen (no kidding, a friend got me a day by day desk calendar with zen things in it and it's FULL of stuff like that). Real lives? Who does that? They are all making candy hearts, I am sure of it. Well, I didn't really have tuna. I am having pizza. I got the pizza deal in fact. They offered me the option of adding a second pizza for a penny. I have a lot of pizza. Do your cats eat pizza? The world is very needy indeed. And you should have as much pizza as you want Lorraine. It is your birthday. If I liked pizza, I have you send me a virtual piece. I went shopping for your birthday, Q. No, not for you - for me. Sales at Kohl's, with an extra 25% off. And, I had to get more cake, since today is really your birthday, and I won't get cake on my birthday (I have my annual physical on my birthday - what was I thinking?) and now I'm home, and you are probably in your bath, and that sounds good, but for me that's always an after-dark treat, not middle of the afternoon, so I won't until later and well, that's it, I guess. No candy hearts here. I hate the things - nasty slimey feel on my tongue when I eat them. Blech. If you are swearing because you are experiencing troubles writing candy stories and nobody is there to hear you do so, is it really swearing? Actually, Siri, I don't like the little blighters either. But as writing material, they have potentials. Writing candy hearts instead of fact sheet and annual report. I was TRYING to sleep Q, I love my animals, I really do but last night was a night from hell being woken up all the time by our darlings. capped off by very early demand for food NOW MUM from Tysie. Happy belated birtday sfMarty and....*trumpets blowing* Happy Birthday Ticia and Adri. Its is your day now, here. Nat those are great! heehee I had my right had a bit off & typed Bat! I love Bats. I'm trying to motivate my een to go the bead store; oooh. she's ready; more upon our return. And I read Phiala's Unicorn Story yesterday... If you haven't read it yet, you should. Very creative. These are great hearts, Phiala. And yes, surely much nicer to make than work (on sunday? That is heathen). Don't eat candy hearts! Write with them! Bengals TRY for Pizza, but so far I am winning! No bath, I would have to go to work for that, and Merry Housekeeper is Dogging for me so I don't need to. Sigh. May have to settle for hot tub. Oh you poor thing. A rotten old hot tub rather than a stinky old bath. Wa wa wa. *settle* for hot tub? Oh the pathos! Or do I mean bathos? Um, sorry. This is what comes of working on Sunday on a three-day weekend. Yes, it is much more fun to write hearts. I wonder if I could write my annual report sections in the form of hearts? Or, more accurately, I wonder how quickly I'd be fired if I turned in my annual report that way? Maybe not such a good idea. Thanks Sally! It's pouring here, which is a fabulous birthday present. I love the stuff Nat's been coming up with on the hearts. Very nice rainy day reading. How's the air over there Sally? Has the smoke cleared at all? It's too rainy and windy here for a hot tub. I hate the cold water that wends it's freezing cold fingers through my hair like a dead lover. Right now the air is okay Ticia, but they'll start the back burning again any minute, and then we can expect the 'smoke haze' to shroud Melbourne (and the state) again. As long as they are doing something though, its okay. I was only half way doing something in real life. On the computer, but not on the web. Also, what candy hearts are people making? Not the nasty ones that come in boxes, I hope! We ARE making heart shaped stories. PS: I did not know you had a blogger account as well, Sandy. Great new site Deva! Happy Birthday! Everything looks and sounds beautiful. Have a "fabulous" day. The candy is up to no good. Riiight. Bed time for me. Sandy Kay have you been lurking here!?! Hi! I was out in the big bright world buying cat food and people food and such like that. Now I am here just in time for Nat to be going to bed and Q to maybe have given up on us. :sigh: It was really nice out there though. I recommend outside. Sunshine and air are good things. Off to visit Tracy's site! Heh, Dan just realized there are used book stores in Stillwater. We're going to have to stay an extra day! Now: Tracy's website. Then more coffee, and perhaps a bananana as I've got the hypoglycemic shakes thanks to skipping lunch. (Not good.) And maybe candy hearts. But more likely dinner. Which tonight is Manwife's Famous Killer Chili. On a baked potato. Yum! Happy tubbing to Q, and birthday to birthday people, and birthdays-coming-up to those with impending birthdays. And Hi Sandykidd and Yoopergurl! And Happy Whatever to everyone else! There used to be the best used bookstore right across the way from the Water Street Inn but sadly it closed down. There are other good bookstores though, esp if you're into antequarian or theological books. Good antique shops too. While you're up for book things you should definitely visit Dreamhaven (Neil's pet bookstore) and Ungle Hugo's/Edgar's. Awesome places all. Hot tubs and cool sisters- doesn't get any better than that. Sooooo......Data Goddess, I think you really -really- need to do the road trip. It's going to be great! Happy Happy Birthday again, Queen Empress! And I get to go home from work now. Sadly, the deadline project is yet undone, so I will be working more tonight. Just home, rather than office. Hi Sandy Kay and welcome! How come everyone knows you but me???? Well, I do now, glad you are here! Data! What a fine idea! I love this plan! The more the better I say! The Bengals are no help certainly. And oh, Mistress, why are you working, we ask????? Do remember to rest as well Lorraine, won't you. But also because I have been hanging with spacedlaw and Aleta on LJ for, like, ever instead of Blogger. Silly me! Ah-ha! Well you are here now, and remember, once you come to my new site, you cannot leave! Book stores ----someone said bookstores????? And I was shopping for clothes? Sheesh. oh, Kay...you'r on LJ? Off to find you. Hi, Tracy, Andrea and SandyK! Jackets all around! And cupcakes! Whoop, abort Map Panic. It was just some sort of Thing What Happened. Everything's there. My bad. Sorry. I didn't do it, Jess! I swear! Oh. And my DH just told the girls, "Children shouldn't play with dead things." I was working because I have that kind of job. Now home, deciding whether to tackle unfinished overdue project tonight or in the morning. Would be easy (tomorrow!) except that I have tomorrow off, and could have an entire day without work work, in which I could catch up on nonwork work. By "catch up" I mean "get marginally less far behind", of course. why hello there. hope you are having the most marvelous of birthdays. i'm off to ponder working a bit more while boy sleeps, but my headache might have other ideas. My LJ is friend locked too. Too much really personal stuff on there. Oh no Vampi - not another headache. Mistress, I am there with you..Just less behind, never caught up. Patience, my dears, there are a lot of things that need fixing and we are getting to them. Like, the only music up is my first cd??ACK! I've been looking at different maps for Fiends, I'd love to have one a little more useable, I fail with this one, and am seeing if one spends a but perhaps if one could get somthing. NOT that I am dissing this one!!!!!!!!!! And we will fix the wall issues, promise. And no blaming Dr WIcked, yes, yes, I know I could get someone else just as good for a few thousand dollars, but I like the guy. And what do you mean Children shouldn't play with dead things????? They very idea! I suppose if they were naughty you could take them away, but really! I haven't signed up with LJ yet because I am already on line TOO much. My husband is PO'ed that it's not all about him any more and I think one more "bright shiny object" might just send him over the edge. Well, he did preface it by saying that we'd have to tell them eventually. We have a dead toad in the bottom of the pond, which currently has next to no water and lots of dead leaves. They were probably poking it with a stick, and I don't know how long the toad has been dead. Probably still squishy. Q, no worries. The map isn't perfect, and if you can find a better one go for it. And we ALL think dr W has done a great job! Wonder when Louisa and Marjorie are going to get back and tell us about the screening in Dublin?????? My guess is they're both standing in a big queue, Q.
I think you 're right Jess. Even if you're not, I like the double Q for yahtzee! Bet they are, hadn't thought of that. No Tweets from Boss in a while. I know no one blames Dr Wicked, I just like praising him...I love my site so, best present ever! Tho Boss did give me Hans for a few days things spring. He is going to screen my back porch, with Bengal Proof screen, so they can go outside. Yay for Bengal proof screening! Yahtzabble would be an awesome game. (Or Scrabzee.) We should patent it. Screenporch! Excellent. I keep thinking about how to do some sort of screened outdoorsy thing for my cats. The house actually has a cat door installed already, but right now it only lets-- bizarrely-- onto a one-foot-square shelf. I'd like to build a little screened side porch. But I need new gutters this year, so it's only a pipe dream for now. Sigh. Yes, part of it has a roof, then the deck kind of continues on, I'll take pics soon and show you , we'll do before and after. It has railings too, so it will be dead easy. I think playing with dead things that have been dead for a long long time is better then newly dead things. Just my opinion of course. To each their own. That might be a great place for you to sleep during those sweltering summer nights. My house has an entirely-enclosed courtyard. The cats can go out there and not have any way to escape. It's a neat house. Dead things are better when they aren't dresh. Might be a fun place to sleep, I am going to have a couch out there. If it is that hot tho, I'm afraid I am an AC girl. I like the idea tho, it is a very private garden, I have a fence and it backs up to a woodsy hill, full of magic. For those of you not on twitter....just drove down to the vet to get Tysie's insulin needles, and the rear vision mirror came away in my hand. Fods it was odd driving without it - I felt blind and insecure. Now my car is technically unroadworthy. boo hiss this is a bad Monday. Little Will has a fever of 101. He refuses to lie in bed; I think he hates to hear the word "sick" and admit that it applies to him. Right now he is curled up in the rocking chair buried in his sweatshirt. Poor little darling boy. yes, unfortunately she does Emily. she responded really well to insulin and dietary changes for over a year but for some reason isn't now. I hope Will's fever breaks quickly, poor little tyke. I best like thousands- and millions-of-years-old dead things. :) And today at my guy's museum, we got to see a replica of a dodo skeleton they just acquired. Very cool! Looks to me like a barrel-chested, overgrown chicken. Ah. I was asking because I have type 1 diabetes. Will's older brother Jack has had a fever lately as well - and his lasted for about three days before it broke, and before that it went up to 104! Hoping William doesn't suffer the same fate. Boo to being sick and having no mirrors but hurrah for Dodo's! May be done Doing Things for today. So those of you in the area, I'm open for suggestions for things geeks shouldn't miss in the area, and I'll pass them on to Husbeast for incorporation into the plans. We're also open for meeting up for beverages/food/book browsing, etc. besides being at the show. We're typical socially-awkward geeks, but we do manage occasionally. Oh DG!! That is so cool! We will have to meet up for sure! Temp went up. He is watching "The Iron Giant" after a shower. I hate seeing him like this, but hopefully it will disappear soon. SPRING IS COMING; please cross your fingers for the Rhode Islanders who do not want anymore snow, even though we are supposed to get more on Friday. Grr. No, Chantrelle, you're good. It's not midnight yet in the Central Time Zone. Look at the time stamp on your comment...you came in 46 mins before deadline! Much phone weirdness today, it stopped getting e-mail then started again, and computer weirdness like not telling me I have mail or not letting me load pages, please Fod not a third computer dying on me! Uh Oh Quiche. Fingers crossed for no more computer failures. I am back on my fixed new lappie. Poor repair man had quite a time - had to discconnect just about everything in the laptops innards to get to the fan. No no no no no! No more computers dying on Ms. Fabulous! That's not the type of spicy we like. In the new Fiendocracy no computers will die before their time, or without being backed up first. Nothing helpful to add. Just saying "Happy Birthday" one more time. I'm glad your computer is up and running Sally. Happy Firbday to Ticia and Adri! I'm sitting here finishing Cormac McCarthy's "The Road". What a writer. What a story. Thanks for making me bump it to the top of my list Sue! Morning, morning, it's a beautiful sunny day in Dublintown. Last night was *excellent*!!! Loved the movie, present were both Neils (Gaiman and Jordan) and Miss Amanda, an appreciative audience, relaxed after Q&A, only wish there'd been more time. Happy birthday Ticia and Adri!! Yeah! Looking forward to the full report with pictures. I'm off to play with Dublin (Louisa has to work :-( ) But there will be full report and pictures later. I like the shiny happy new website. & Happy belated birthday! May is a long time to wait for Coraline, sigh. Are we getting 3D version here in UK as well? Na, I agree, millions of years old dead things are my favourite too, got to play with lots of them during my degree. Although I decided not to pursue it as a career after spending hours studying and attempting to identify fingernail-sized fragments for my dissertation - why did I get the baby sea scorpions when they could grow to a couple of metres?!! *crawls out of a tv-induced haze* Oh yes, someone did mention Buffy was on Hulu, didn't they? Two whole seasons of it. Happy belated birthday, Quiche! I snuck in an on-time greeting on facebook. Happy Birthday Ticia and Adri! Happy day after your birthday Q. Happy Firbday Adri! Happy Firbday Ticia! Going back to see the Dodo again, but mostly going to see the person there doing balloon animals, and I don't mean just your little poodles and such. She does 6-foot-high statues of things! As well as fun stuff kids can take with them. I'm going to take pics if I can. Oh yeah, and give my guy a ride home, I suppose. Thanks Louisa, AletaMay, and Na (and anyone else my pitifully not-yet-awake brain has forgotten)! TEA! Coraline and dodos, and balloon animals! I can hardly wait for pictures. It is still raining here! That is just incredible! For me, the rain is the BEST thing about this long weekend. Happy Firbday, Adri and Ticia! Happy days to Adri and Ticia! Dragons are a close second, followed by fairies, My Little Ponies, unicorns/pegasuses/horses, and anything "cute" in indeterminate order. DD2 is still close enough to her sister that they share interests, though I don't think DD2 is quite as obsessed with dinosaurs as her sister. She is more interested in fairies and/or princesses than her sister, though. ariandalen - have you seen these t-shirts? Hee hee. Have you been down to the Texas Memorial Museum? Good dino fix there. Dreary and rainy...no school for boy, no work for hubby. Cozy day in the house. Oh, Na, I'm so glad DD1 wasn't sitting next to me as I clicked the link! She would be jumping up and down yelling, "I want one! I want one!" Yes, we have been to the Texas Memorial Museum. Just last August as a matter of fact. DD1 got the front and back T. rex/Stegosaurus/Triceratops on black t-shirt, and DD2 got the pink Dino Girl t-shirt. The Mayborn Museum at Baylor has lots of fossils and a mock up of the mammoth dig site north of Waco. There are lots of people working very hard on making the mammoth dig site a national site. They are getting close, but no guarantees. I want one I want one! Oh I loved dinosaurs and My Little Ponies too when I was a little girl - good that some things never change! Didn't My Little Ponies become all skinny, they were cute and plump when I was little. Let's see...Happy Firbday, Ticia and Adri, and a belated Happy Firbday to Queen Q, cause I don't think I got to actually type that yesterday. Am at the "If I ever volunteer to do costumes again, somebody kick me" stage...two weeks to the first time every has to be in costume. All 76 of them. Some of these kids have five costume changes. ONE of them is complete. I NEED AN ASSISTANT...or a bunch of Brownies, of the English sort. Not Girl Scouts. I promise I won't thank them with clothes. A belated Happy Birthday! I'm the man from Chapters Bookstore in Dublin that arranged the signing with Neil, but it's another matter I was hoping I'd be able to ask you about: I'm tracking down information on Alan Moore's musical output, and was hoping I could ask you a few questions about your recording of Dorothy Parker and Me...? And welcome. Surely you can ask me questions. Why don't you drop me a note at fabulouslorraine@gmail.com ?